Today wasn't another 21 run affair like we had in Arlington on Wednesday night. Tonight was expected to be more of a pitchers duel, with Felix Hernandez going for the Mariners and Jake Peavy hurling for the White Sox. The Sox came into the game with an 8 game winning streak and Peavy himself had won his past 3 consecutive starts. Felix, well, he hasn't. Hernandez has only won a single start in his last 4 outings and that was May 21st against the Rangers. Other than that, he was totally roughed up in Cleveland, suffered a loss to the Yankees allowing too many homers and the same to the Angels when he allowed two homers, one of them a grand slam. Today was more of the same. In the 5 innings of work that he put in he gave up 3 homers, walked 4 while striking out 6. Felix gave up 4 runs, all earned and left the game down 4 to nothing. Luckily for Felix, the offense picked him up. After he left the game, Kyle Seager hit a homerun with Dustin Ackley aboard and the M's were in business. That was in the 7th inning. In the 8th it was Seager again that brought in a run on a single to right that scored Ichiro and sent Ackley to 3rd. After Jesus Montero bit the big one by popping out to the catcher with a runner on third, Justin Smoak came to save Montero's tail. Smoak hit a soft line drive to right that dropped in front of Alex Rios and Ackley scored. The game was now tied and Felix was off the hook. Brandon League replaced Felix in the 6th and pitched an inning and two thirds and Charlie Furbush got the last out in the 7th. The Shawn Kelley came out to pitch the 8th. Kelley was up at the beginning of the year and didn't have too hot of a start and is now back after spending some time in Tacoma. The inning started off bad. When I say bad, I mean really bad. Michael Saunders, who made a terrific diving stop just the inning before took a Paul Konerko fly ball off of his face to lead off the inning. Konerko wound up on 2nd base. Kelley kept firing to the plate and after getting Rios to ground out, he intentionally walked A.J. Pierzynski to put runners at the corners. Dayan Viciedo struck out swinging and Alexei Ramirez to the plate who would end up hitting the game winning single to score a run. The Sox would score two more on a single by Alejandro De Aza and end up winning by a score of 7 - 4. Shawn Kelley took the loss in this one, although none of the runs given up were earned runs due to the error in center field to start the inning. There are other factors that come in this loss. One of them being Miguel Olivo who grounded into two double plays and grounded out with runners on 1st and 2nd with only one out. Another, Jesus Montero who popped out with a runner at 3rd and only one out. He popped out to the catcher, that is exactly what you are not supposed to do. Pretty upsetting. Last but not least, Felix. Giving up 4 runs in 5 innings, walking 4 hitters. This is not Cy Young material. Where did that go? I want the real Felix Hernandez back. It was reported that Felix was taked out of the game in the fifth because he tweaked his back, but Felix insisted it has nothing to do with giving up the homeruns. There have been a lot of them lately and it has me speculating that there is some type of undisclosed injury. We'll wait to hear if there is any more news that comes from this. 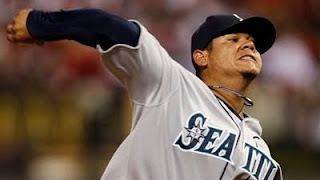 Felix has to get it together, because at the moment, he looks like our number 5 starter, not our ace. The goods of the game came from Seager and Smoak who continually swing a hot bat and drive in runs. I don't think of this game as any tremendous setback for the team, I just see a King who has lost his power. Let's hope he pulls it together really soon.